Retinal cavernous hemangiomas is a rare vascular tumor unilateral, isolated, and non-progressive; however, may have dominantly inherited syndromic neuro-oculocutaneous presentation. This tumor is usually asymptomatic and infrequently present with visual impairment from vitreous hemorrhage, secondary pre-retinal traction, or macular involvement. Diagnosis can be made from characteristic fundoscopic and imaging findings. Latest novel non-invasive imaging technique is optical coherence tomography angiography (OCT A) permitting segmental and dynamic analysis of retinal vasculature from new perspective. Here we analyzed multimodal images of retinal cavernous hemangiomas; emphasizing on OCT A characteristics of the disease as there is paucity of literature on same. A 54-year-old female with right eye decreased vision to 6/36 due to cataract underwent routine fundus examination which revealed protruding hamartoma having numerous, dark, blood-filled saccular aneurysms embedded in white fibroglial tissue along the supero-temporal vein [Figure 1]a and [Figure 1]b. Fluorescein angiography showed delayed and incomplete perfusion within the lesion and late “capping” of the dye with no leakage [Figure 1]c. Optical coherence tomography showed multilobulated cavernous spaces arising from the inner half of retina with an overlying firm adhesion of the hyaloid [Figure 1]d. OCT A images clearly demonstrates one moderately reflective large caliber retinal vein draining the lesion and “bunch-of-grapes” like nodular changes within tumor; a well-known feature described for this disease [Figure 2]a and [Figure 2]b. Few of tortuous abnormal branching vessels extends into the lesion which is appreciated as root-like projections [Figure 2]a. OCT A angio overlay confirmed low flow circulation in the relatively isolated vascular saccules and the combined analysis with cross section OCT b scan localizes the hamartoma in inner half of the retina [Figure 2]c. Ultrasonography showed well-defined retinal elevation with high internal reflectivity and no choroidal excavation or acoustic shadowing. Neuroimaging revealed no related cerebral cavernomas. Definitive diagnosis of right eye retinal cavernous hemangioma with cataract was made. Patient underwent cataract surgery with intraocular lens implantation; vision improved to 6/6 and the lesion remained stable at follow up. Retinal cavernous hemangioma is a rare hamartoma found primarily in females, incidentally diagnosed in asymptomatic patients. Tumor is characterized by grape-like clusters of thin, non-fenestrated endothelial lined saccular aneurysms with interconnecting disorderly fibroglial tissue. Fluorescein angiography (FA) remained the mainstay for diagnosis. FA demonstrates hypofluorescence in the early phase and slow filling of tumor in late phase; relatively isolated from the retinal circulation. Sluggish blood flow within the tumor causes plasma-erythrocyte layering in larger aneurysms giving appearance of “fluorescein capping” and intermixed lobules of hyperfluorescence and hypofluoresence in the later stages of angiography. There is absence of feeder vessel and the extravagance of dye is rare. In recent time, OCT A has come up as non-invasive imaging tool which acquires volumetric scan and provides structural and blood flow information in tandem. Enface OCT A through the lesion displays hetrogenous reflective nodular and grape-like cluster changes along a morphologically dilated retinal vein [Figure 2]b. Additionally, small amount of tortuous abnormal branching vessels extends into the lesion which is appreciated as root-like projections of vessels, as noticed in earlier reports., On angio overlay, low flow in the saccular dilated venous system of the angiomatous lesion is demonstrated [Figure 2]c. The contents in the cystic cavity of the lesion was different from normal retinal vessels circulation. This feature accounts for sluggish flow in the expanded tumor vessels and hence the difference in reflection intensity from normal retinal vessels. The intensity difference on OCT A illustrates the relative isolation of the blood flow between the tumor and the retinal circulation. Aforementioned OCT A finding of retinal cavernous hemangiomas correlates well with the already known characteristic feature of disease on fundus imaging and FA. Further, the cross-section analysis of OCT b scan and angio overlay showed tumor mass occupying the inner layer of retina and the vitreous traction spanning around its surface [Figure 1]d. This topographic detail was advantageous in evaluating the risk of vitreous hemorrhage. Hence, the confirmative diagnosis of tumor may necessitate angiographic study but OCT A also clinches accurate diagnosis in a non-inferior way. OCTA obtains high-resolution visualization of stratified retinal vasculature and therefore is more sensitive to vascular abnormalities. 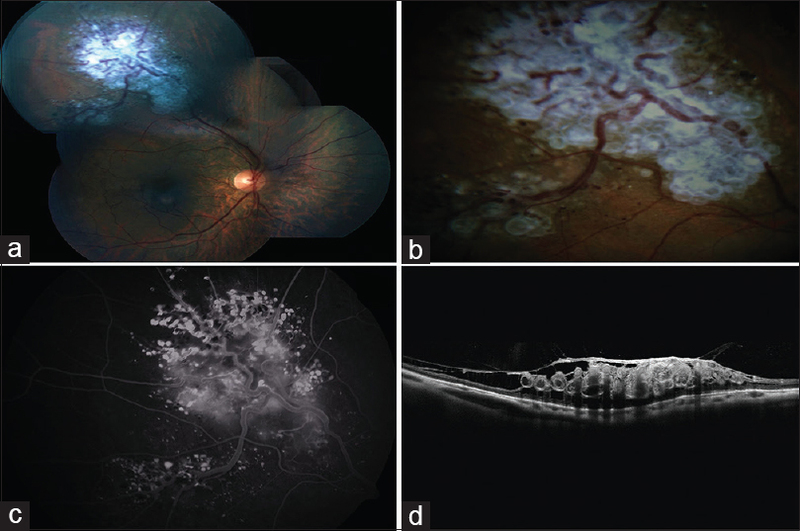 Our case highlights the OCTA features of retinal cavernous hemangiomas for the better understanding of the disease and supportive of existing limited literature. However, further studies are required to establish OCT A as diagnostic tool at par with other available imaging modalities. Gass JDM. Cavernous hemangioma of the retina: A neuro-oculocutaneous syndrome. Am J Ophthalmol 1971;71:799-814. Shields J, Eagle R, Ewing M, Lally SE, Shields CL. Retinal cavernous hemangioma: A fifty-two years of clinical follow-up with clinicopathologic correlation. Retina 2014;34:1253-7. Wang W, Chen L. Cavernous hemangioma of the retina: A comprehensive review of the literature (1934–2015). Retina 2017;37:611-21.
de Carlo TE, Romano A, Waheed NK, Duker JS. 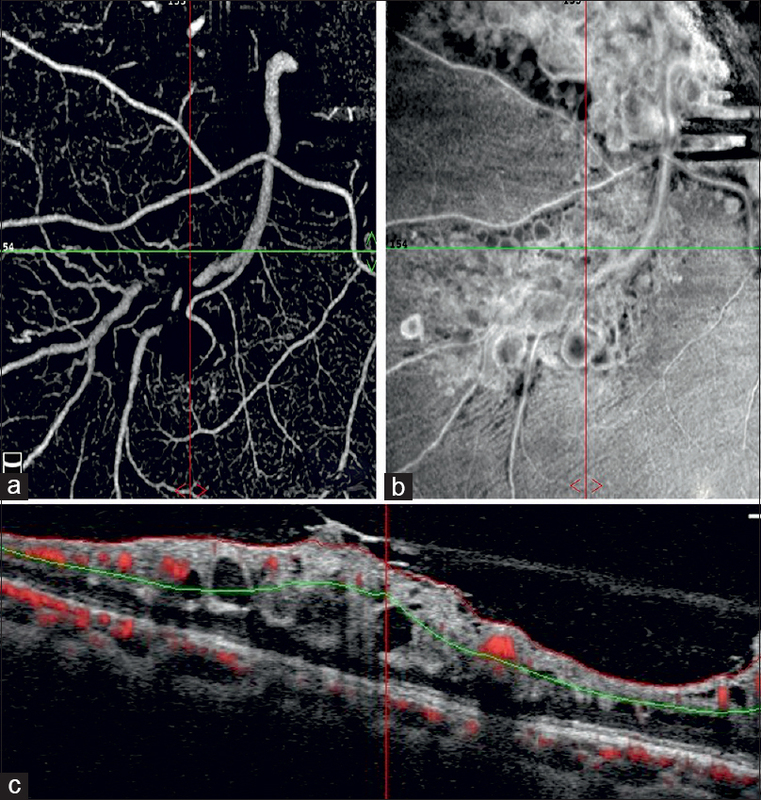 A review of optical coherence tomography angiography (OCTA). Int J Retina Vitreous 2015;1:5. Lyu S, Zhang M, Wang RK, Gao Y, Zhang Q, Min X. Analysis of the characteristics of optical coherence tomography angiography for retinal cavernous hemangioma A case report. Medicine (Baltimore) 2018;97:e9940. Kalevar A, Patel KH, McDonald HR. Optical coherence tomography angiography of retinal cavernous hemangioma. Retina 2017;37:e50-1.